Keep the area safe from interference, vandalism etc. To keep a hazardous area out of reach of the general public especially the children. The fact that these fences are easily available on rent for installation makes them both functionally and economically viable. There is also no time limit to renting these fences and temporary fence rental companies like DiamondProvides.com help in the installation and its subsequent upkeep for as long as one wants in lieu for a token rental amount. Thus when the need for the same gets over, these fences can be easily dismantled and taken away for reuse at some other place of need. Be prepared to withstand efforts made to compromise its structure. Need for windscreens depending on whether the place of installation is windy or not. Health and safety concerns: In order to meet up to the safety, security and health concerns of the different states, the temporary fence rented needs to comply with specific regulations. Before the final selection of temporary fences to be rented and installed, it is necessary to ensure that these regulations are met to avoid complications and problems from arising later on. Cost: The budget needs to be finalized before the final selection is made. For this, it is not only necessary to fix up a budget for the same taking into account quotes from different companies, but it is also important to see that the temporary fence selected provides value for money. Installation: There are times when temporary fences need to be selected and installed within a short time frame. Hence it is always better to opt for the ones which are easy to install and can be done without putting in much effort, manpower or time. Flexibility: Since the uses of temporary fences differ along with the dimensions and nature of the space where they are to be installed, fences which are flexible have greater utility. Thus in order to ensure versatility of these fences these temporary fences should be flexible enough to be configured easily as per the requirements. Strength: The stronger the fence, the better will be its ability to withstand efforts made to trespass into the property or to suffer damages. 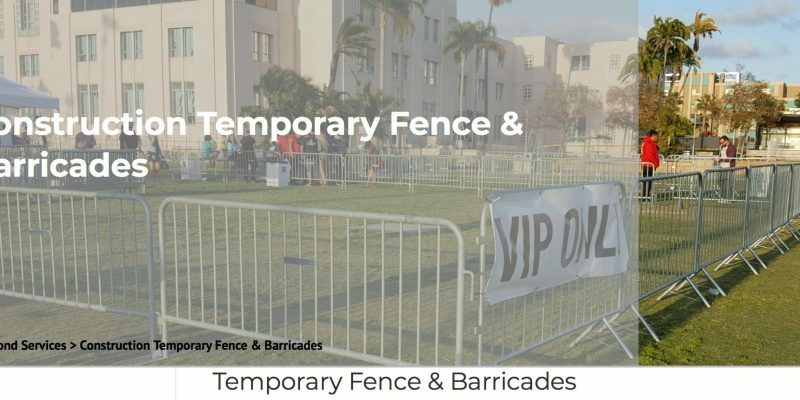 Thus the selection of the temporary fences has to be mandatorily done on the basis of its strength especially when it is to be used for controlling large crowds or for the protection of heavy equipment. Ones that are pre-built and which need to be brought over to the space to be fenced and just placed for getting the job done and the other needs to be built from scratch. Both of these categories of fences have their own advantages and uses. Thus while the pre-built fence can be installed and used almost immediately, the ones which are built from scratch need relatively more time to be installed and used. Similarly, the ones which are built from scratch offer better protection and stability in comparison to the pre-built ones. In fact, building a temporary fence from scratch offers greater flexibility since they can be contoured based on the shape and the boundary of the work site or plot thereby ensuring maximum space utilization. However, each different type has its own set of uses, and in their own way, they are individually ideally suited for the same. For example, a construction worksite will need a temporary fence to be installed from scratch while for an event a pre-built fence offers the necessary service. In short, it can be said that when pre-built fences are perfect for instances wherein the requirement is for a very short time period and when the requirement is for a longer duration, the fence needs to be built from scratch. It is thus very important hence to select temporary fence based on the requirement, space measurement and the time required for. The above points, if followed, provide ample help in this context.